Tonight we send birthday wishes to Woodrow Charles Herrman who became better known as Woody Herman, one of the all-time greatest band leaders and one whose place in Jazz history is secure. Woody was born May 16, 1913 in Milwaukee, Wisconsin and passed away at age 74 on October 29, 1987. Woody led so many great editions of his bands that he called "Herds" that this one is no exception. Recorded over a period of three nights at Basin Street West in Hollywood in May of 1963, this edition contained a great rhythm section of Nat Pierce on piano (who was also the band's chief arranger), Chuck Andrus on bass and the amazing Jake Hanna on drums. Some of the stars in this band were Bill Chase and Billy Hunt on trumpets, Phil Wilson and Harry Southall on trombones and as always a superb saxophone section with Bobby Jones and Bill Perkins on tenors, Frank Hittner on baritone and the stupendous Sal Nistico on tenor who at the time was the band's most exciting soloist and who's work on the up-tempo tunes left the other players with open mouths!.Then there is "The Old Man"...the glue that held the band together with his warm work on alto saxophone and clarinet and his occasional vocals. Happy Birthday Woody.....Jazz music was changed for the better by your person and your encouragement of young talent. 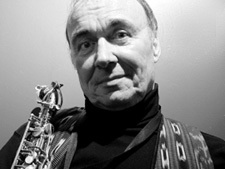 Woody Herman forever!! !